This image may look like something dreamed up for a surreal horror movie, but it’s a real horror for the tarantula in question. 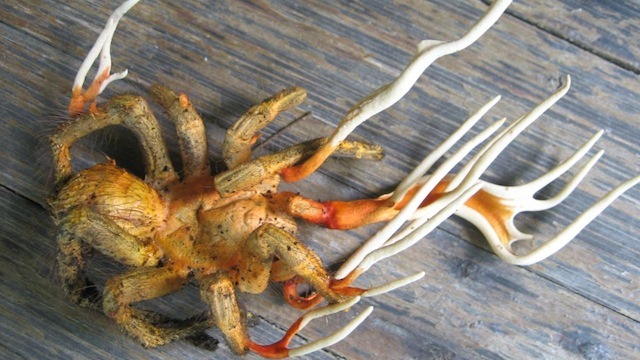 This unfortunate arachnid is infected with Cordyceps, a parasitic fungus that replaces its host’s tissue with its own. Really, when it come to being nightmarishly frightening, tarantulas have nothing on this freaky fungus. Talk about star power—a new study shows that dung beetles navigate via the Milky Way, the first known species to do so in the animal kingdom. The tiny insects can orient themselves to the bright stripe of light generated by our galaxy, and move in a line relative to it, according to recent experiments in South Africa. “This is a complicated navigational feat—it’s quite impressive for an animal that size,” said study co-author Eric Warrant, a biologist at the University of Lund in Sweden. A dung beetle rolling its ball in South Africa. Photograph courtesy Eric Warrant. Once the beetles sniff out a steaming pile, males painstakingly craft the dung into balls and roll them as far away from the chaotic mound as possible, often toting a female that they have also picked up. The pair bury the dung, which later becomes food for their babies. That’s why ball-bearing beetles have to make a fast beeline away from the pile. “If they roll back into the dung pile, it’s curtains,” Warrant said. If thieves near the pile steal their ball, the beetle has to start all over again, which is a big investment of energy. Scientists already knew that dung beetles can move in straight lines away from dung piles by detecting a symmetrical pattern of polarized light that appears around the sun. We can’t see this pattern, but insects can thanks to special photoreceptors in their eyes. The Milky Way glimmers over Indonesia. Photograph by Justin Ng, Your Shot. Attracting the beetles proved straightforward: The scientists collected buckets of dung, put them out, and waited for the beetles to fly in. But their initial observations were puzzling. S. satyrus could still roll a ball in a straight line even on moonless nights, “which caused us a great deal of grief—we didn’t know how to explain this at all,” Warrant said. To test the star theory, the team set up a small, enclosed table on the game reserve, placed beetles in them, and observed how the insects reacted to different sky conditions. The team confirmed that even on clear, moonless nights, the beetles could still navigate their balls in a straight line. Lastly, to confirm the Milky Way results, the team put little cardboard hats on the study beetles’ heads, blocking their view of the sky. Those beetles just rolled around and around aimlessly, according to the study, published recently in the journal Current Biology. The scientists put hats on the dung beetles to block their ability to see stars. This beetle, which is wearing a clear hat, acted as a control in one experiment. Photograph courtesy Eric Warrant. He added that this discovery reveals another potential negative impact of light pollution, a global phenomenon that blocks out stars. “If artificial light—from cities, houses, roadways, etc.—drowns out the visibility of the night sky, it could have the potential to impact effective orientation and navigation of dung beetles in the same way as an overcast sky,” Whipple said. Study co-author Warrant added that other dung beetles likely navigate via the Milky Way, although the galaxy is most prominent in the night sky in the Southern Hemisphere. As for the beetles themselves, they were “very easy to work with,” he added. Here’s the poop on why dung beetles dance: to orient themselves. The insects “dance”—or spin atop their dung balls—when they hit a snag in their paths that throws them off their straight-line courses, scientists report in a new study. In recent experiments, beetles were more likely to dance when the insects encountered an obstacle or lost control of their balls—suggesting the dance allows them to get their bearings again. When a dung beetle finds a dung pile, it cuts off a piece, shapes the poop into a ball, and rolls the ball away to a distant location for burial and consumption. With dung-ball thieves always underfoot, a ball-bearing beetle has to hustle—and a straight line is the most direct method of escape from competitors, according to the study, published January 18 in the journal PloS ONE. But this can be a challenge, since dung beetles roll their balls facing backward, their heads to the ground, oblivious of obstacles or holes that lie ahead. A dung beetle atop its ball. Photograph courtesy Emily Baird. “Our findings are exciting because they suggest that dung beetles have developed very clever, robust techniques for orienting in a complex and ever-changing environment,” study leader Emily Baird, a functional zoologist at Lund University in Sweden, told me by email. Baird found dung beetles obliging participants in the experiments, which took place on a farm in northwestern South Africa. “It’s always great fun to do experiments with the dung beetles, as they are willing to roll and dance for long periods of time, even when we put them in the most unusual experimental situations, such as making them roll along a curved track, or causing them to repeatedly fall off a drop,” Baird said. His father made this video slideshow this year. It is only because of our misunderstanding that we think the person we love no longer exists after they “pass away.” This is because we are attached to one of the forms, one of the many manifestations of that person. The person we love is still there. He is around us, within us, and smiling at us. This body is not me; I am not caught in this body, I am life without boundaries, I have never been born and I have never died. Over there the wide ocean and the sky with many galaxies all manifests from the basis of consciousness. Since beginningless time I have always been free. Birth and death are only a door through which we go in and out. Birth and death are only a game of hide and seek. So smile to me and take my hand and wave goodbye. Tomorrow we shall meet again or even before. We will always be meeting again at the true source, always meeting again on the myriad paths of life. And at the end of all our exploring will be to arrive where we started and know the place for the first time. Just as a mother would protect with her life her own son, her only son, so one should cultivate an unbounded mind towards all beings and loving kindness towards all the world. I depart as air….I shake my locks at the runaway sun. Our favorite couple shows their true colors. I just got them done, but soon I will put them in a scary setting. Maybe I’ll have them eat Joe Miller’s brains.